1) The Experimental Lake Platform consists of 16 artificial lakes (30 m x 15 m x 3 m deep, 800 m3each) conceived for incorporating the natural complexity of the environment and the spatially heterogeneous nature of ecological processes in natural ecosystems. These large experimental systems are spatially structured, with shallow littoral areas, a central pelagic zone and a central benthic area, and may be interconnected by groups of 4 lakes through 10 m long dispersal channels. The artificial lakes will be equipped in Autumn 2014 with automated sensors and data loggers. The two other artificial reservoirs (126 m x 15 m x 3 m deep, 4000 m3) are a stocking lake (south) used to homogenize water before distribution to experimental lakes or mesocosms and a drainage lake (north) that can collect and purify used water at the end of experiments. 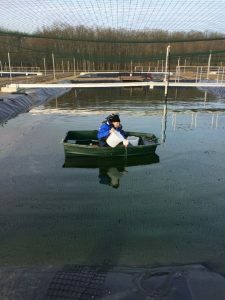 2) A large number of mesocosms, from a few hundreds of liters to a few tens of m3, high degree of replication; Floating mesocosms installed on the stocking lake; more than 60 tanks installed outdoors and equipped with devices for the experimental control of thermal gradients and water mixing; beaters that generate waves, control of the physical structure of the water column. 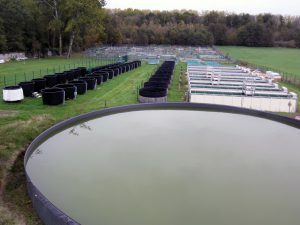 3) Microcosms from one to several litres of volume for continuous cultures experiments; climatic chambers of the Ecotron IleDeFrance (precise conditioning of the environment and the detailed monitoring of states and activities of organisms and ecosystems) to study marine or freshwater ecosystems (plankton, benthos, macrophytes) under highly controlled environmental conditions. A series of dedicated sensors enables monitoring of gas exchange (O2 and CO2) between the air and the water in the experimental system. Effects of human disturbances on aquatic biodiversity, community structure and ecosystem functioning. Long-term study of the bottom-up and top-down control of the functioning of complex communities with heterogeneous spatial distributions, consequences of anthropogenic pressures on biodiversity, up to the species at the top of the food web. Studies of the link between physical constraints and the functioning of aquatic systems. Instruments and equipment available in the labs include flowcytometer, spectrophotometer, growth cabinets, laminar flow hood, fume hood, -20°C and -80°C freezers, autoclave, oven, liquid nitrogen, distilled and ultrapure water, microscopes, centrifuge, precision balances, algae culture facilities, FlowCAM, etc. Field equipment includes samplers, fixed sensors, multi-parameters probes, BBE fluorimetric probes, BBE benthotorch, small boats, etc. Some experiments with fish may also be conducted in a fish house. CEREEP – Ecotron Ile de France is able to host up to 30 sleeping guests (12 double rooms and a dormitory for students). 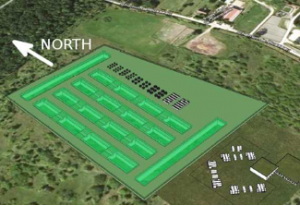 In addition, through cooperation with the laboratories associated in the PLANAQUA project, the CEREEP – Ecotron Ile de France may favour collaboration with other laboratories in Ile-de-France and access to other facilities.